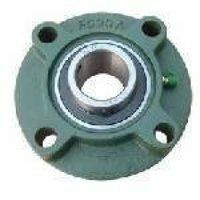 View our range of flanged bearings; including 4 bolt hole flanged cartridge bearings. They are often used on fabrication work or within the agricultural industry. This bearing is a complete unit i.e. housing with pre-drilled holes & bearing insert. (These bearing inserts are also available as a separate item, helping to keep future maintenance costs to a minimum).